Thua Thien Hue Province, November 2013 Banyan Tree Lăng Cô was awarded ‘Best Villa Development, Vietnam’ at the Southeast Asia Property Awards 2013 held in Singapore. Angsana Lăng Cô was also highly commended in the ‘Best Condo Development, Vietnam’ category. 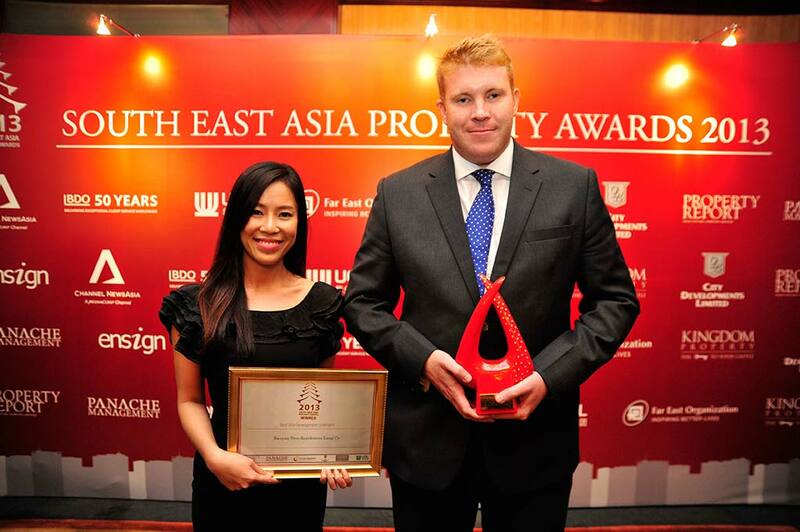 Over 300 guests from around the region – including Singapore, Malaysia, Indonesia, Thailand, Philippines and Vietnam – gathered on 31 October to congratulate the winners and highly commended companies at the third annual South East Asia Property Awards 2013. The gala dinner and presentation event was held at the Shangri-La Hotel in Singapore and awards were given recognising the region’s best developers, developments, real estate service providers, architecture, and interior design firms. The reward received by Banyan Tree Lăng Cô acknowledges the architectural beauty of the resort’s world-class villas, which take inspiration from both their surroundings and the splendour of nearby Hue’s ancient Imperial City. With stunning interior design, a mesmerising location, and incredible attention to detail, the residencies in Banyan Tree Lăng Cô offer a rare kind of luxury. Sat at an altitude of 25 to 86 metres above sea level, our hill villas provide simply breathtaking views over the ocean and mountains beyond. It is a panorama of paradise. Perfect beaches and lapping waves from the East Sea sit on your doorstep, while from your dream home you can watch birds soaring through the lush forests that surround the residencies. The view from each villa is particularly spectacular from the spacious terrace, which comes with its very own private plunge pool. We are delighted that our dedication to perfection has been successful and we are extremely proud of our accolade from the South East Asia Property Awards for Best Villa Development. Meanwhile, the highly commended Angsana Residences Lăng Cô is located within the sensational and highly-acclaimed Laguna Lăng Cô, Vietnam’s first and largest truly outstanding integrated resort. Framed by a pristine three-kilometre beach and picture-postcard countryside, the residences are in an incredibly tranquil environment and offer an ideal beachside getaway. We are proud to have introduced the first three-storey beachfront condominium of its kind to Vietnam at Angsana. Each one or two-bedroom unit arrives fully and stylishly furnished, featuring contemporary design, breathtaking ocean views and world-class facilities at the doorstep – including fine dining, art galleries, a kid’s centre, a state-of-the-art gymnasium, and a luxurious spa. Located in close proximity to UNESCO World Heritage Sites including the ancient city of Hue, the temple ruins of My Son, and the historic town of Hoi An, there is also a wealth of opportunities for nearby exploration. We are proud to have been commended by the South East Asia Property Awards for our Angsana Residences and we are looking forward to watching this unique development prosper further in the near future.